We’ve previously enjoyed a lovely breakfast at The Old Crow and when looking for somewhere to go for a night out in Northbridge it was once again at the top of our list. The Old Crow was busy though not overly so, despite it being a Saturday night, and we were able to get a table inside. The menu allows you to order a meal for yourself or to have it tapas style and share amongst the table. Always a fan of tapas, we elected to share! We found the service to be prompt but a bit rushed. The staff were cordial but hassled so didn’t necessarily have the warmth that we had experienced at breakfast there. 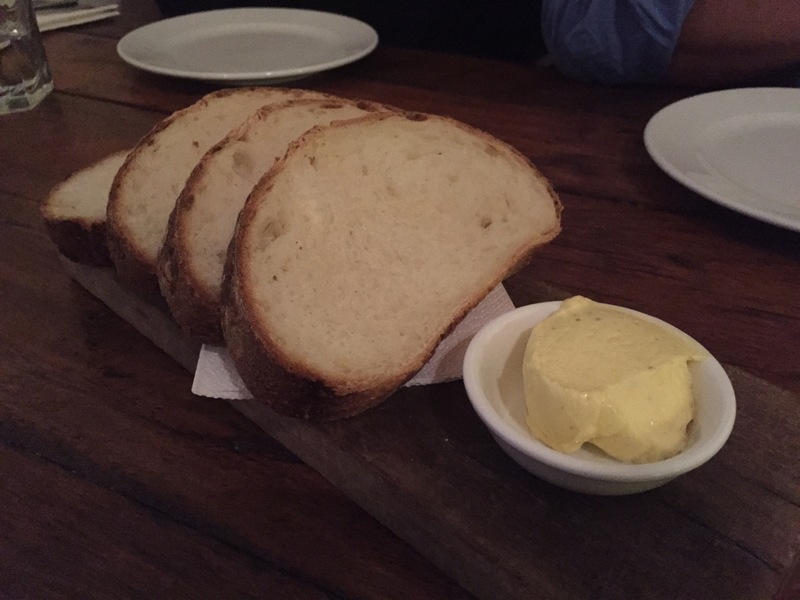 We started with complimentary sourdough, fresh and delicious, served with a fennel butter. Always a fan of crispy pork, our next choice was the crispy pork bits. This was a really strange dish, not the kind of crispy we expected. It tasted more like a sweet and sour, a mix of crispy and chewy that we weren’t really sure we liked. Intentional or not it was more on the odd side and probably not something we’d order again. I’m a huge fan of brussel sprouts, in fact I consider them a widely unappreciated vegetable but if you disagree with me on that I may have just found the dish for you. 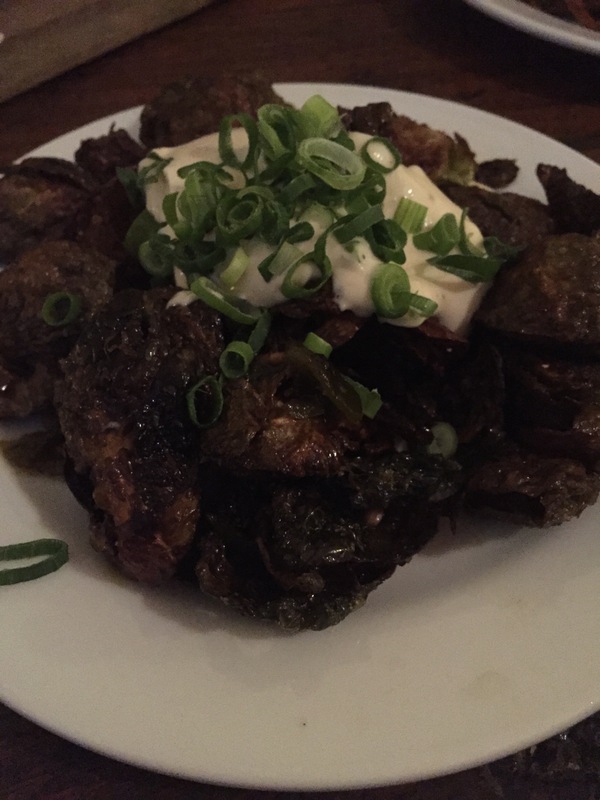 This was brussel sprouts like nothing you’ve ever had before. They were crispy, charred, a little salty with a chilli jam and a creamy, cooling sauce. A dish that any foodie could appreciate and an absolute winner in my books! We also tried some of the larger dishes, more conventional ‘main’ meals. 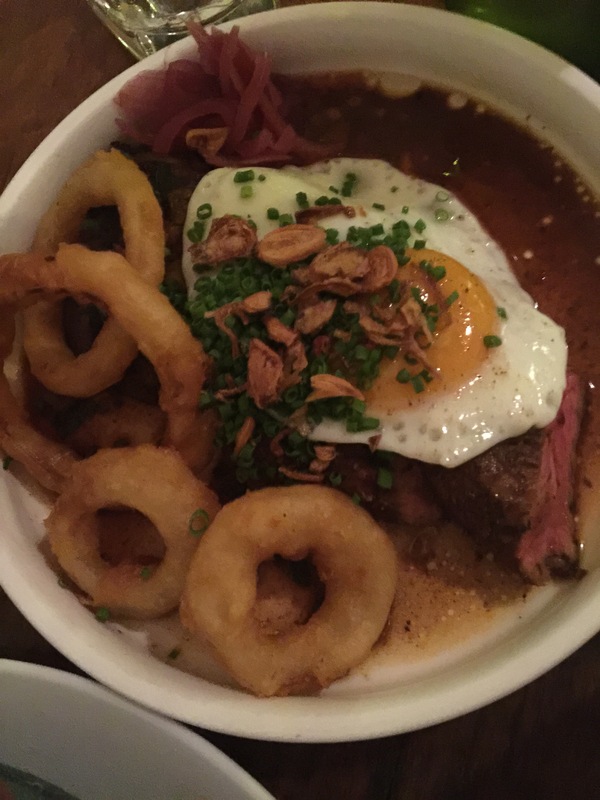 The flank steak is served with onion rings and a fried egg. The steak was tender and juicy, not to mention nicely seasoned. We found the onion rings to be good but not the best we’ve had. The egg felt a bit odd and redundant, it was nice enough but no one was really that fussed about eating it. The crunchy shallots were a nice touch though. 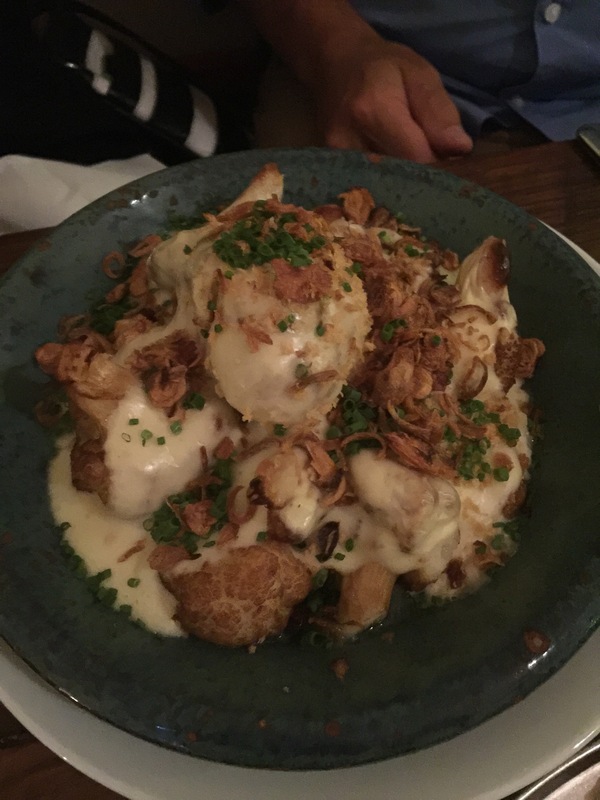 Another fantastic veggie dish was the cheesy cauliflower. This was pretty much exactly as promised, a huge serve, perfectly cooked cauliflower, firm, but not too firm and a good moistness and a whole lotta cheese. Simple, but delicious! 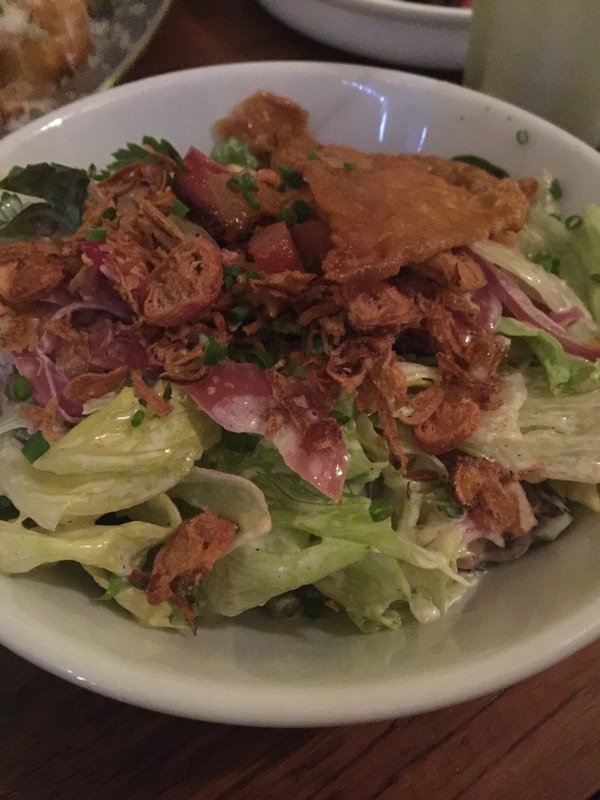 We also tried a salad with bacon bits, crispy chicken skin and lettuce. It was a solid dish, you needed to make sure you got a bit of everything in each bite to really experience it though. Unsurprisingly, the crispy bacon bits were the standout element! The Old Crow do a tasty and interesting dinner in a warm and cosy environment. Perfect for Perth summer nights! 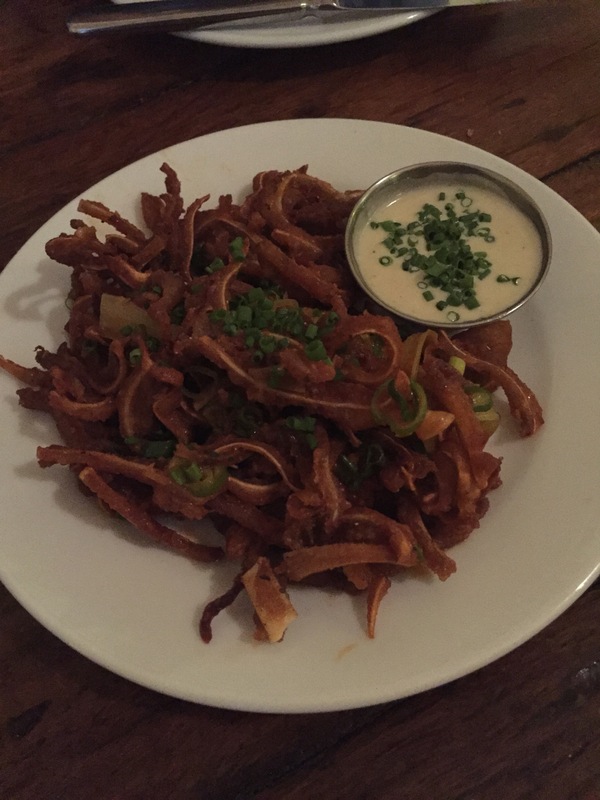 Oh it looks like deep-fried pig ears because of the cartilage in there…did you manage to find out exactly what it was? Oh that could be it! We never worked it out, it was a really sweet and sour-esque crackle. Oh I love this place! I went for brunch recently, will need a return for dinner for my brussels sprouts fix (I love them too)!